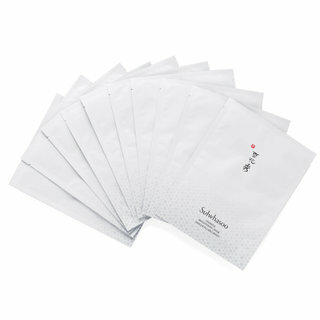 An intensive brightening mask fermented with white ginseng that promotes a bright and clear complexion. Drenched in a unique lightweight brightening serum formula, this mask helps brighten for a noticeably clearer complexion after a single use. Through two weeks of fermentation with white ginseng extract, this advanced bio-cellulose mask locks in moisture and key brightening ingredients for a long lasting effect. Made from material 500 times denser than regular pulp masks, this ultra-fine mask adheres comfortably, sticks to your face like second skin, while its highly effective brightening formula quickly absorbs. Use up to twice weekly and leave on for twenty minutes. After removing the mask, gently pat remaining serum.